of this unusual and interesting year. Everyone wants to see magnificent gowns and jewels, right? My style, when I'm not photographing in an open paddock with cows (this week), is to be dressed up ... I love dressing up, I love beautiful clothes and finery. One of my favourite colours I love to wear is red, elegant red, I think it is also such a wonderful colour to wear when entertaining, especially at this time of the year. I love our rich Australian summer colours mixed with european decorations, chinoiserie, red berries, silk embroidery, red baubles, red cocktails and red gowns. Valentino's red lattice and scroll detailed gown above is elegant and the inspiration for my party. If I could, I would make a table cloth from this amazingly beautiful fabric. I would have all the glasses etched the same way and dusted with red glitter and I would send out the invitations to you tucked into fine tissue lined envelopes embossed with this design. The presents and little gifts would be wrapped with red criss-crossed ribbons on white paper and the food would be festive and fresh. Flowers and fruit would be delivered straight from the markets to my home. The tables are filled with decorations, the Christmas tree is up, lights on, there are red flowers in the entrance and my family are dressed and ready ... stop stop stop Coty... stop, you're going way too far now. Entertaining should be effortless, but it's not! There is a lot work behind putting something like this together, so for the moment I will keep it in my mind and my imagination. The reality is I'm busy working on the deadline of the December Issue for Styling magazine, due next week. We will be celebrating our very first birthday, can you believe it? 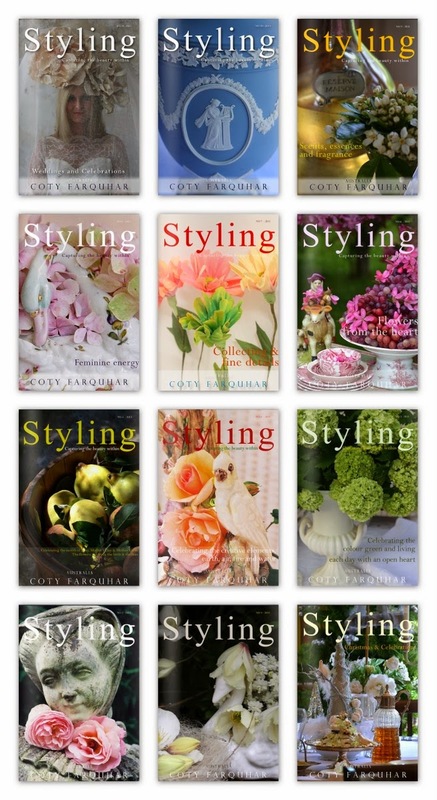 Styling Magazine is now one year old, that's nearly thirteen issues published. Do you remember our first issue? December 2012 Christmas and Celebrations. but, I think this year it will only be a bottle of bubbly. A girl's gotta dream - Wishing you a wonderful festive season. 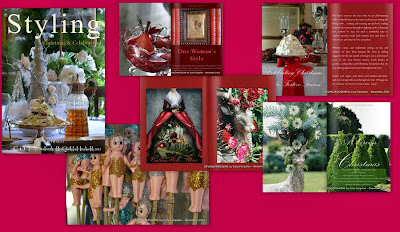 Images from Styling Magazine and... our always inspiring Pinterest images. This month Tina of The Enchanted Home chose the topic for our party. all of our ideas, fancy or casual, outfits & drinks, menu and music. to see what everyone else is doing. Drop Dead Gorg10eous. And SO Coty. Your montage of red photographs just takes my breath away. What an enormous effort you put into this post, and it shows X10. Thank you so much, always, for joining our wonderful group of By Invitation Only. We are blessed with the most brilliant, creative and caring women in the blogging world and I appreciate all of you. Big congrats on the e-zine !! Simply stunning, Coty...you have such STYLE! Gorgeous! I would love to attend a red themed cocktail party too...especially if you are creating it. You are truly brilliant. Cheers to the joys of the season! Your red theme is gorgeous! Congratulations on your year anniversary for the magazine. I always look forward to your posts - true feasts for the eyes. Coty, this was so inspiring! I have so much admiration for what you do and was thinking of you last night as I was trying to do a verrrry elaborate setup for photographing my cocktail that just looked ridiculous. I thought "My, this styling business is hard!" and finally just did two simple photos. Hehehe. And simple is great isn't it? Just like your lovely red. Bisous from Provence and a Hearty Congratulations on your First Anniversary! Such beautiful images! Congratulations on a rears worth of magazines. The most beautiful "post in RED", dear Coty! So enchanting, uplifting and warm! Gorgeous images, really GORGEOUS and so DELIGHTFUL! Such beautiful reds, what a wonderfully Christmassy post! Hi Coty...OMW...its so beautiful here... I don't want to leave!!!! Love to wear red and have splashes of it all over my house, not only at Christmas. looking forward to the next issue of the magazine. CONGRATS on the one year!!! "just a bottle of bubbly" sounds wonderful…what more does a girl need, really? That, with loved ones, is a party all by itself.